A Chinese beautifying selfie app, that is taking the world by storm with it’s ability to turn mere mortals into anime characters, has raised red flags with security researchers for its apparent excessive collection of data. Meitu, which is available for iphone and android, has been popular in China since its launch in 2008, but is only now gaining prominence elsewhere as selfie lovers have turned to the app in their droves sharing their perfected pictures across social media sites. Naturally enough, the app requests access to your camera and photos but also seeks GPS location, service provider information, Wi-Fi connection data, SIM card information, jailbroken status, and various other personal identifiers that could be used for tracking purposes which has raised the alarm. New Meitu app is pretty funny. You get to look kawaii for selling all your personal data and soul to China. Privacy researchers noted that the app requires more data access than for a standard photo app and also raised questions about how this information is being shared. Meitu told C-Net it is not selling customer data to anyone but is using the data collection code because the company is headquartered in China, where tracking services provided by the Apple App Store and Google Play are blocked. "To get around this, Meitu employs a combination of third-party and in-house data tracking systems to make sure the user data tracked is consistent," said a Meitu spokesperson. "Furthermore, the data collected is sent securely, using multi-layer encryption to servers equipped with advanced firewall, IDS and IPS protection to block external attacks." 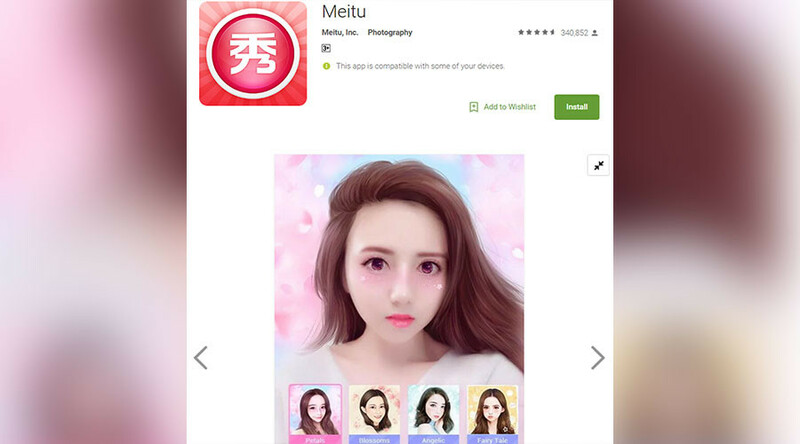 Another possibility, according to Digital Trends, is that Meitu is collecting information to comply with new Chinese government regulations that requires app makers to identify their users and prevent them from uploading banned content. The app is available in 26 countries with more than a million users in each and a total of 430 million users outside China, according to the company website. Usage in the US has spiked over the past week jumping from a mere couple of hundred daily downloads to hundreds of thousands in recent days, according to Recode. Meitu claims the application turns photos into works of art by adding anime like features including huge eyes, skin whitening and rosy cheeks. It also allows you give your body a digital makeover with ‘slimming’ and ‘longer legs’ features. Some users have given the app the ultimate challenge - transforming politicans into works of beauty.